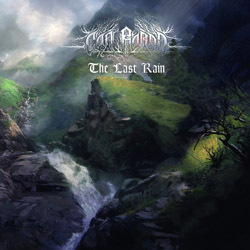 Epic atmospheric folk black metal band Cân Bardd, the personal project of Malo Civelli from Switzerland will release its second full-length album called “The Last Rain” on February 22nd, 2019 via Northern Silence Records. Influenced by bands such as Caladan Brood, Elderwind, Saor and Gallowbraid, Cân Bardd was founded in 2016 by then 18 year old Malo Civelli, with the purpose of creating an outlet for his feelings and ideas that would be at once heavy and aggressive, yet also melodic and atmospheric. With the debut “Nature Stays Silent” Cân Bardd already enthralled a lot of fans in the atmospheric black metal community. “The Last Rain” continues where the debut left off and yet turned into a huge step forward from the already very good material of its predecessor, with improved songwriting, as well as an excellent production. Everything is better with this album, more mature, coherent and better compositions with real acoustic instruments and finally, a design created specially for the band, that represents the music. The album includes 5 songs for a total of 50 minutes and it comes as collector’s edition in a 4-panel digipak CD edition with 8-page booklet, limited to 999 copies. The band has already unveiled the amazing cover artwork by Edouard Noisette, the album tracklist, as well as the opening track that you can listen to below.